Babis “Bob” Katsionis may not be household name to most people, but in his native Greece he is pretty much a rock superstar. Playing guitar and flashy keyboards for various metal bands, he has cleaned up in the Greek Metal Hammer’s annual readers’ poll to win best keyboardist five times in as many years. He is also founder of Progressive Vision Group, a video clip making company, which has made over 90 videos for rock and metal acts. Prognosis & Synopsis will be his 5th solo album, with the title purporting to a new future direction. Citing influences as diverse as Vangelis and Yani, coupled with the more rockier Kevin Moore and Keith Emerson, this latest release has combined these disciplines to create an instrumental album more on the metal side than the atmospheric – it’s the drums that kind of give it away, not to mention his dexterity on the noisier side of the six-string. It is also of note that Spotify and iTunes will not be bothered by this album as (along with other formats) a release in Icon-DiscTM will occur. This is essentially an App that will contain all the music and much other interactive content – a futuristic approach indeed. Use ‘tinter web’ technology to discover more on his Bandcamp page or maybe older listeners may like to ask a younger brother. 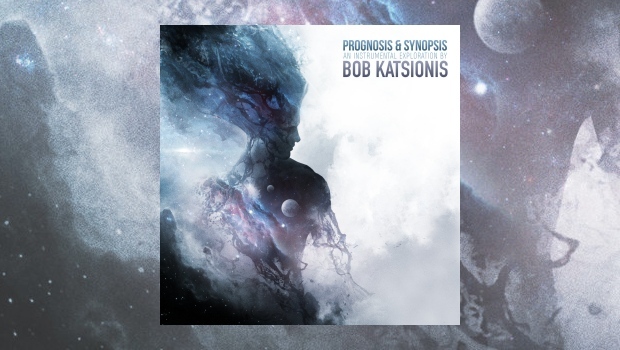 Album opener Prognosis starts with a synth whoosh and after its Jean Michel Jarre start it crosses the border into Steve Vai territory, fine lead guitar duelling with lead synths and all wrapped up in ‘bulldozer the house down’ drums. In fact, you’d be forgiven if you thought this was an album by a guitarist, because that is really the main weapon of choice here, but considering that it is all played by Bob, except the drums, it does have a band feel which is all down to the spot-on production. There are moments of calm throughout the tracks and record, but it mostly returns to form. Dark Matter leaves the metal in the foundry and it is mentioned in the notes that this is his preferred direction. As he says, something that can be played live but could still sound like a Blade Runner accompaniment. There are visions of flying cars and monorails reflected in visors as an android jogs through a futuristic city, and it’s rather good but way too short. In fact, only the last track breaks the six minute mark as most are around four, which is a shame because there is room to expand, but this never really happens. Asymmetric Parallels ups the speed and introduces the piano with more of the heavy stuff following in Aegean Sunset. The Messenger is very Tangerine Dream and cinematic, but then it’s back to speed metal on Cold Embrace, but now a sort of European orchestral arrangement comes into play, think Royal Hunt or maybe sections of Nightwish but without any singing to fall back on. Amnesia is far from forgettable for the same reason, with a welcome reduction in the tempo. Ending with Synopsis and a final impressive go at all the instruments at his fingertips, a big slab of space rock keyboards with that constant guitar crunch. However, in a surprising turn of events, the last two minutes turn into a funk odyssey which is definitely an interesting addition. Solo albums by keyboard players can be hit and miss but with so much equipment to fall back on, the excitement can be oddly underwhelming. The freshness of, for example, Tim Blake’s (of Hawkwind fame) Crystal Machine still causes a stirring even though it was made in 1977. They can also be quite a demanding listen as us humans like words with our rock music, but as a representation of this kind of opus Prognosis & Synopsis is in the recommended list. To that end, this recording will inevitably make the listener want to check out the other fine collaborations that Bob Katsionis is or has been involved in, notably the bands Firewind, Outland and Revolution Renaissance.